The core campaign is a 16-day blogging marathon with one blog article published for every day of the 16 Days of Activism. Each article is a list of 16 positive ideas and/or solutions revolving around a specific theme related to VAW. Each idea and/or solution is bite-sized – simple to understand and easy to put into action. These articles are part of a growing online resource of ideas and solutions for preventing, stopping and ending VAW that The Pixel Project is building as part of their commitment to inspiring and galvanising individuals and communities to take that first step towards helping stop VAW. 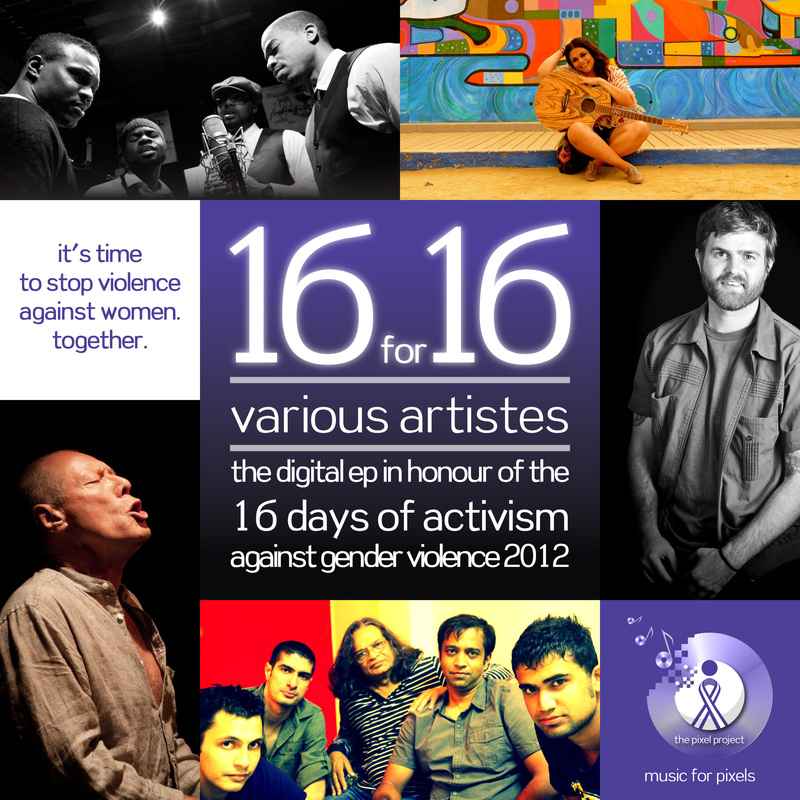 The EP line-up includes 5 artistes from around the world who have come together to use their music to say NO to VAW. They are: AHMIR – the #1 YouTube R&B group and The Pixel Project’s YouTube Music Ambassador; Pete Ahonen – Folk-Pop Singer-Songwriter from San Francisco/Bay Area, USA; Sarah Carpio – Pop Singer-songwriter from Tijuana, Mexico; The Other People – A Pop-Rock band from Mumbai, India and the winner of The Pixel Project’s Fall 2012 YouTube Cover Carnival; and Tony O’Malley – A veteran Jazz-Pop singer, songwriter and pianist from the UK. The Pixel Project is a complete virtual, volunteer-led global 501(c)3 nonprofit organisation whose mission is to raise awareness, funds and volunteer power for the cause to end violence against women through innovative, powerful viral campaigns across various online and virtual channels including social media. Their first project is the Celebrity Male Role Model Pixel Reveal campaign which aims to turbo-charge global awareness about VAW using social media while raising US$1 million by getting a global audience to collectively unveil a million-pixel mystery collage of Celebrity Male Role Models at US$1 per pixel. Music For Pixels, a campaign by The Pixel Project, is the first music-based social media campaign to exclusively collaborate with YouTube artistes speaking up to prevent and stop VAW through music video PSAs while raising funds for the cause via digital music downloads. All funds raised from the portion of the song’s proceeds donated by artistes in 2012 will go towards the Celebrity Male Role Model Pixel Reveal campaign in benefit of the USA’s National Coalition Against Domestic Violence, The Pixel Project and various anti-VAW nonprofits from around the world. 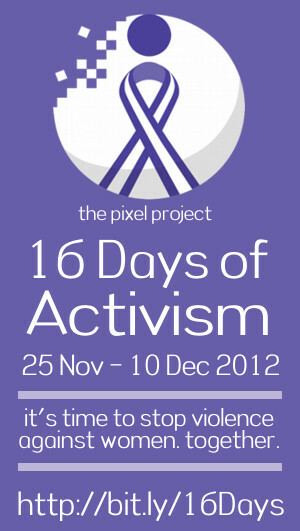 For further information, please contact The Pixel Project team at info@thepixelproject.net. 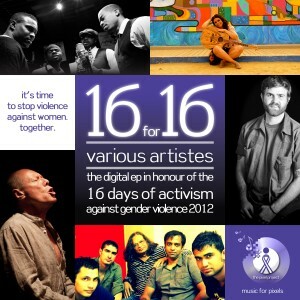 This entry was posted in 16 Days of Activism, Announcement, Latest, Music For Pixels and tagged 16 Days of Activism, 16 for 16, Activism 101, Ahmir, Amazon.com, Bell Bajao, Google Music, iTunes, Man Up Campaign, Music Activism, Music For Pixels, Stop Street Harassment, The Pixel Project, VAW, Violence Against Women by regina. Bookmark the permalink.